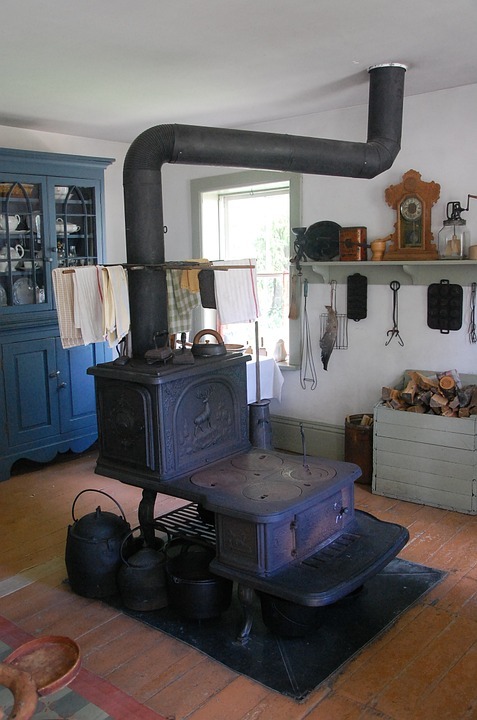 On a visit to a pioneer village, one of the cooks dressed in period costume boasted that she could cook any recipe on her wood stove except foods packaged for the microwave. The author of Old-Fashioned Woodstove Recipes makes the same claim and lists some advantages of using this type of stove. The first advantage: wood stoves are more economical than electric stoves, especially for slow-cooking stews, soups, and pot roasts. Cooking over wood enhances the flavor. I definitely agree with this second advantage. When my husband adds mesquite wood chips to our charcoal grill, burgers taste much more appetizing. The aroma of food cooked on wood burning stoves also increases the anticipation of a meal. This type of stove adds warmth to the home in cold winter months. Hang damp clothes nearby to dry them. Heat water in the stove’s water reservoir to supply hot water. It may supply enough to turn off electric water heaters for a few hours and save money on electricity. The reservoir also adds moisture to the air, acting as a humidifier. Enhancing the taste of meals is the biggest advantage for me. I don’t own a woodstove, but I’d love to learn to cook on one. Collester, J.S. Old-Fashioned Woostove Recipes, Bear Wallow Books, 1988.